Sunpu was a wealthy fish wholesaler in Edo. The wholesale carp business, particularly prosperous at that time, made it possible for him to provide such great support to Matsuo Basho. The Koiya store 鯉屋　maintained a carp farm in Fukagawa. Basho later lived in a remodeled cottage that had previously been the caretaker’s lodge at Koiya’s carp farm. The cottage was named Basho-an after a basho (banana) tree growing near the cottage, and Basho adopted the same for his pen name. Known as the "town of green, water and serenity,"Koto City figured significantly in the life of Matsuo Basho, who left a great contribution to the literature of Japan. In 1680 Basho left Nihonbashi, in Edo (as Tokyo was then known), to live in a thatched cottage in Fukagawa, some distance away from Nihonbashi the center of the city. At that time, Fukagawa was a quiet, swampy area,　and the Basho (banana) tree planted by one of his disciples grew so luxuriantly that his cottage was known as the "Basho-an", and "Basho" became his pen name. 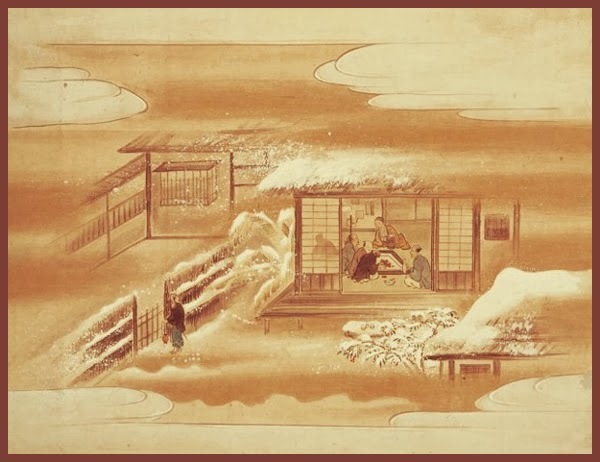 Living in Fukagawa, or using it as the base for his journeys around Japan, Basho established the present form of the haiku, producing many excellent works by which the haiku, until then regarded primarily as an entertaining　pastime, gained acceptance as a major literary genre. It was also in Fukagawa that Basho sat down to write most of his travel journals, including his most famous one, The Narrow Road to the Deep North. We know that after Basho's death, the Fukagawa "Basho-an" cottage was preserved as a precious historic spot within the site of a samurai residence, but it disappeared at some time in the late 19th century. After the great tidal wave that swept the area in 1917, a stone frog that Basho is believed to have been fond of during his lifetime was discovered, and in 1921 the Tokyo government designated Tokiwa 1-3 as the historic site of the Basho-an. However, the designated plot was too small to restore the site to its original condition, and continued efforts were made to procure the surrounding land. Eventually this was accomplished and Koto Ward made the site a historic landmark. 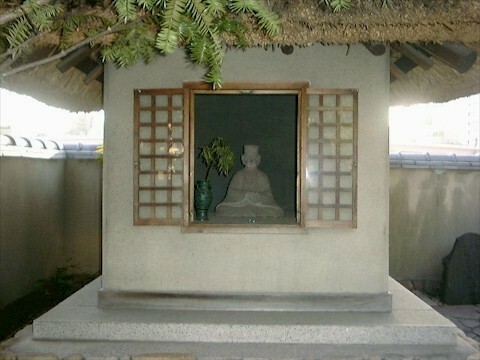 The Basho Museum opened on April 19, 1981. 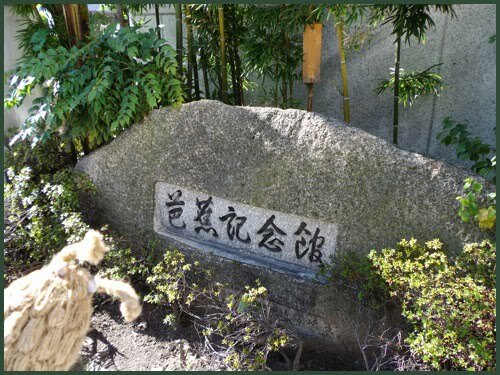 In the garden are a small shrine and pond, and on exhibit are artifacts related to Basho and haiku poetry contributed by such men as Manabe Giju. The museum also serves as a center for literary research and holds regular haiku meetings, and through such activities contributes to the preservation and advancement of culture.
. The Great Bridge of Fukagawa 深川大橋 - 新両国橋. Shin Ryogoku-bashi . Basho-An was near the Mannenbashi 万年橋　"Ten Thousand Year Bridge". One landmark that draws only a few visitors, but is nonetheless a place of great importance in Edo, is the so-called "banana villa" (Basho-an). It is the home of Matsuo Basho, one of Japan's greatest poets. Matsuo Basho's real name was Matsuo Munefusa. He was born in western Japan, in the town of Ueno, and spent the early years of his life as a teacher of Chinese classics and poetry. However, in 1666 his main student, the son of a leading daimyo, died. Matsuo retiring from teaching and became a semi-reculse, living on an estate in Fukagawa owned by one of his former students. 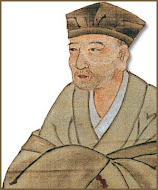 Matsuo planted a large banana tree (basho) in the garden, and as a result, his retreat came to be known as the basho-an (banana villa), and he came to be called Basho no Matsuo (Matsuo, of the banana villa). Matsuo Basho was one of the greatest haiku poets of his time. His greatest collection of poetry is the book Oku no Hosomichi (The Narrow Road Through the North Country), which he wrote while making a pilgrimage to northern Japan in the later years of his life. Although he died in 1694, his canal-side retreat at the banana villa continues to attract poetry lovers, who come to pay their respects to this remarkable man. After he had come back from three years travellng, his friends had set him up again at Bashoan　芭蕉庵, the Banana Hut at Fukagawa, Edo. His discipled had take off one leaf and written eight haiku on its backside. This was placed on one of the pillars. From his hut, Basho enjoyed to watch the autumn moon. Zhang Hengqu (1020-1077) and Huaisu (725-785). Zhang Hengshu gained strength for his studies just by gazing upon the emerging leaves."
. hokku nari Matsuo Toosei yado no haru . Matsuo later changed his name from Tosei "Green peach" to Basho (Banana). 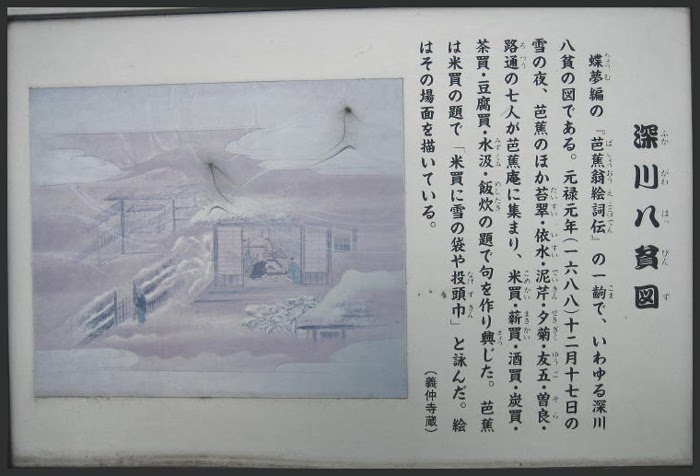 In 1678 延宝６年 he had put up his "shop sign" Tosei and become a professional Haikai Master 俳諧宗匠.
. WKD : "spring in this lodge", yado no haru　宿の春 . of the ogi reeds . . .
. Planting the first banana tree with his disciple Rika 李下 . On that day he wrote about the first narcissus.
. hatsu-yuki ya suisen no ha no tawamu made . Basho was fond of "first snow" and made some trips to friends when he heard the good news. Now finally it has started snowing on his own home and he is happy to be there. shows his great joy about the snow. I got some rice from friends. 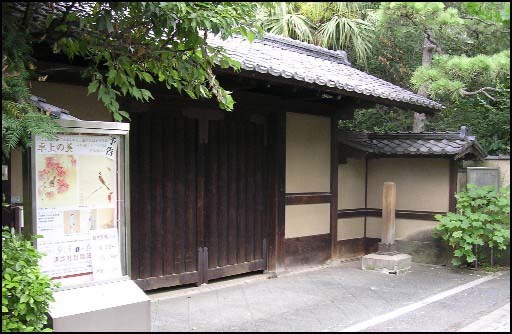 The hut refers most probably to his second Basho-An in Fukagawa. Someone of his disciples had brought him newly harvested rice to support his poor life. Basho leads the life of an intonsha 隠遁者 a recluse and makes fun of his lifestyle.
. WKD : The Japanese Rice Culture - . Utagawa Hiroshige (1797–1858) - One Hundred Famous Views of Edo. #40.
. Basho-An　芭蕉庵 in Fukagawa, Edo . 深川の芭蕉庵 - Image of the "Frog Stone"
Basho lived for about three or four years in the Sekuguchi Basho-An, where clear spring water comes out of the back mountains. This clear water is said to be the inspiration for the "sound of water". This home was lost due to a fire. The dates vary, it seems he started living in Sekiguchi from 1677 till 1681 (from about age 34 to 38), while he was involved with the work of the water supply system of the Kanda waterway　神田上水. The place was called Ryuuge-an 龍隠庵 Ryuge-An "Dragon Sanctuary", the dragon being the deity of water. Later in 1726, the place was re-named after Matsuo Basho, and called Sekiguchi Basho-An. Now there is a traditional Japanese garden to enjoy. 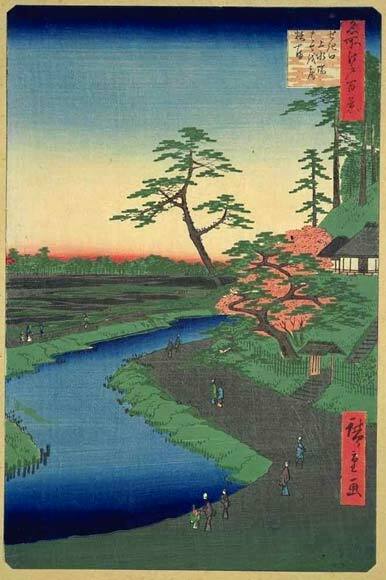 The woodcut print shown here depicts a rural idyll northwest of Edo. A meandering river nourishes an expanse of rice paddies on the left-hand side. Two men are crossing a bridge, and more people are walking by the riverside. On the rising ground behind them, a cluster of thatched houses identified as “Ryuge-an (Dragon’s Retreat)” nestles amid pine trees. The river is the Kanda, an important drinking-water resource for the citizens of Edo, whose source is Inokashira Pond in Mitaka, western Tokyo. In another 1830s’ rendition of the area, the same artist, Hasegawa Settan 長谷川雪旦, depicts a large stone dam, where the river water used to enter a canal that ran about 5 km to the city’s northern border.
. Basho working for the waterworks department of the Edo .
. an　庵 hermitage, thatched hut / yado 宿 my home .
. awa hie ni toboshiku mo arazu kusa no io .
. Saigyō no iori mo aran hana no niwa .
. kakurega ya tsuki to kiku to ni ta san tan . Fukagawa Happin 深川八貧 "Eight Beggars of Fukagawa"
Deikin 泥芹, Isui 依水, . - Yasomura Rotsuu 八十村路通 Rotsu - . , Sora 曾良, Taisui 苔水 / 岱水, Yuugo 友五 Yugo and Yuugiku 夕菊 Yugiku (Sekikiku 石菊) . 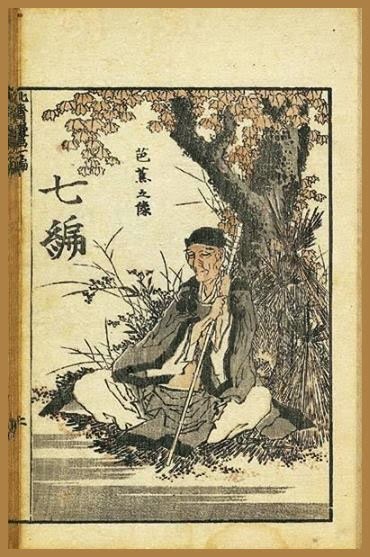 kanboo no majiwari 管鮑の交わり the friendship between the Chinese poets Guan and Bao.
. kome kai ni yuki no fukuro ya nagezukin .
. Du Fu 杜甫 To Ho . and his meetings with poor friends 「貧交行」. He lived close to Basho in Fukagawa. He compiled the collection Kiso no Kei 木曽の谿 "The Ravine of Kiso". Son of doctor Honma Michietsu 本間通悦 from Hitachi Itako 常陸潮来. In establishing the Shogunate, Ieyasu embarked on a project to protect Edo from water hazards. In those days there were two rivers flowing through Edo, the larger of which was the Tonegawa, and the other the Arakawa, which was notorious for breaking its banks and overflowing. Nearby inhabitants thus were often exposed to the danger of flooding. Ieyasu diverted the Tonegawa in stages towards the east, separating it from the Arakawa to protect Edo from floods (fig-2). As a result of this initiative the Tonegawa now flows directly to the Pacific Ocean rather than into Tokyo Bay as it originally did. This was called “Tosen”, or the Eastward Relocation of the Tonegawa.
. Minuma Water Deity 見沼 and Edo .
. Basho Inari Jinja 芭蕉稲荷神社 Basho Fox Shrine . Hearing that, Kikaku suggested using yamabuki ya or "wild yellow rose --" as the first line, since the image of the newly blooming yellow rose captures the pathos of spring leaving and the imminent arrival of summer. Basho finally rejected the elegant, colorful flower for "old pond --," a simpler image that puts the focus on the actual frog and on the pond. In response to this dialog between Basho and Kikaku more than a century earlier, Issa in the original hokku in 1816 imagines how the frog in Basho's mind is transformed from being a sound juxtaposed with a flower into the main actor in the hokku. Ah -- the frog might be telling the flower if its polite phrase were unpacked -- beautiful yellow rose, you are certainly worthy of going first, but Basho just told me to get moving and jump into that pond, so I'll have to pass you and leave you behind here on the pond's edge. You'll have to pardon me for going ahead of you like this. In Issa's humorous dramatization of the creation of Basho's hokku, the cutting word ya at the end of the first line also functions, because of the context, as a particle used by the energetic frog to get the attention of the yellow rose, so I believe this cutting word can be translated with either a dash or a comma. 2) use a gesture of some sort to identify the person who should go first. In both versions of Issa's hokku, it is the frog's diving stance and act of diving. 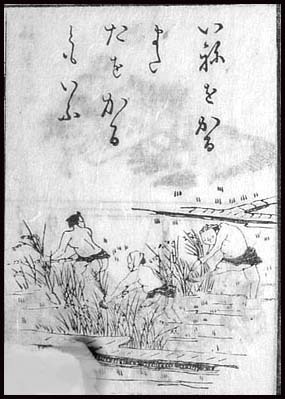 In the later variation of this hokku, translated first above, on one level the frog apparently asks the old pond itself to pardon him for the abrupt jump Basho has decided the frog will make into its water. In this hokku the frog's apology to the yellow rose may be implicitly assumed, since "go first" implies the frog has moved in front of something else and thereby entered Basho's hokku, so the frog may also be apologizing for having pushed by the yellow rose. 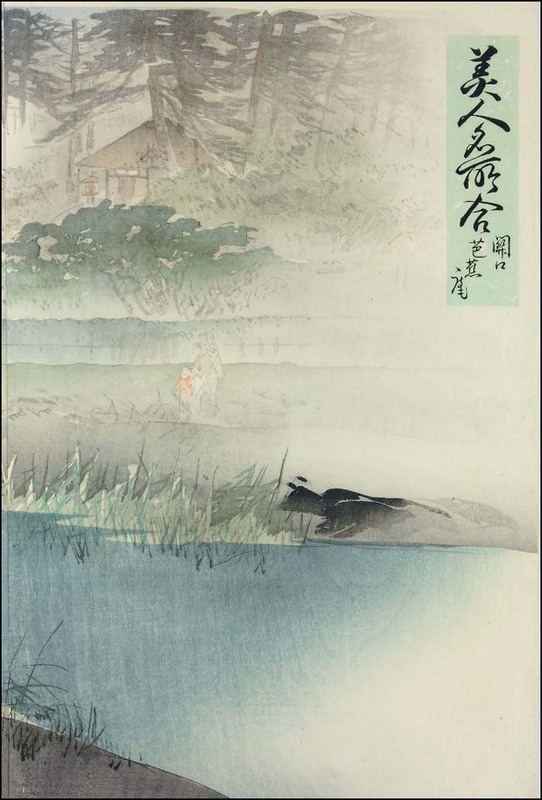 In Basho's hokku the pond itself is a more important and imposing presence than the "water" in Kikaku's version, a presence deserving the politeness shown by the frog in Issa's later version. Nevertheless, like Basho the vigorous frog doesn't hesitate to push forward and dive. In Issa's time, the area in which Basho's hut was said to have stood was part of the large garden of a warrior lord. A stone memorializing Basho is said to have stood near the pond there that was believed to have been the one where Basho heard the jumping frog.